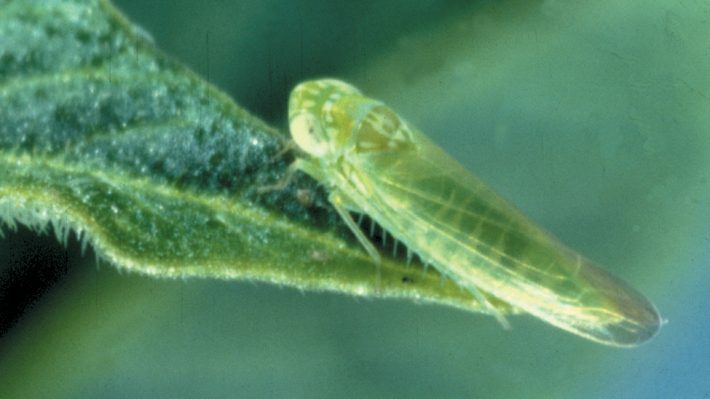 Despite the wet weather, potato leafhoppers (PLH) are thriving in many areas of the province. Hopperburn is evident in the second crop of alfalfa, though dry bean fields are also at risk, especially once insecticide seed treatments are no longer present in the plants. 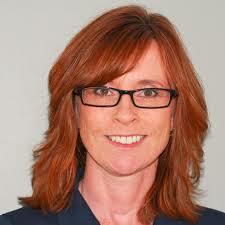 Unfortunately, once hopperburn is noticed, yield and quality has already been compromised. 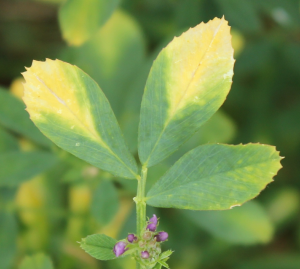 Though PLH-resistant varieties of alfalfa are available, new seedings are still vulnerable, as the glandular hairs are not fully expressed the first year. Use the conventional thresholds below for first year seedings of these resistant varieties. Scouting in alfalfa: Scout every 5–7 days. Take 20 sweeps from five areas of the field. Determine the average number of PLHs per sweep. Next, take 20 alfalfa stems at random and record the average plant height. Scouting in dry beans: Walk in an “X” pattern. In 10 areas of the field, pick 10 trifoliate leaves that are newly and fully expanded from the centre of the plant canopy. It is important to note that PLH adults readily fly away when disturbed, which makes them difficult to count on excised leaves. 1 1 sweep = 180° arc. 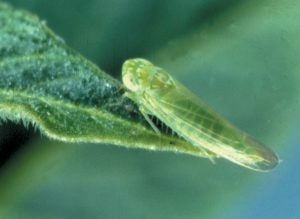 2 The taller the alfalfa, the more leafhoppers can be tolerated before control is necessary. Use a foliar insecticide if thresholds have been reached. A naturally occurring fungal pathogen helps reduce the populations of the PLH under warm, moist conditions but predators and parasites appear to play a minor role in controlling this pest. Insecticide options are listed in the Field Crop Protection Guide.